Since 2008 I’ve taken some pride in having my daily blog written and published on the web no later than eight ayem NoMatterWhat. Granted, there have been a few misses. But very few until this past February 28th when Nyel broke his hip and our lives suddenly turned upside down for a bit. Right now, for instance, it’s seven in the evening and I’m just sitting down to reflect on things. 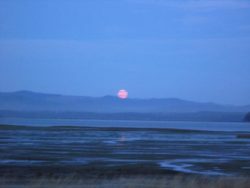 I wouldn’t be surprised if soon I’ll be blogging by moonlight! 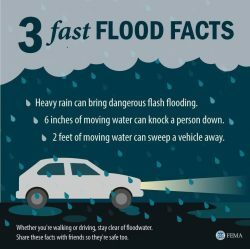 Today started at 4:00 A.M. with hurry up and get ready, eat breakfast, pack a lunch… hurry because the EMTs are coming at 5:30 to get Nyel into the car. It was non-stop from that point on – up to Seattle to see his cardiologist who had juggled his busy schedule to check Nyel out. Yes, Nyel has a great deal of extra fluid aboard (what were those St. V. people thinking???). He is also iron deficient anemic. And his meds need tweaking. We are SO glad his doctor urged Nyel to make the trip, painful though it was for him. And did I say that driving up and back to Seattle in a day is not my favorite activity even when I’m not doing all the driving — which I was this time, of course. But… it was SO worth it on so many levels, the most important being peace of mind after three weeks of great uncertainty. Now we can concentrate fully on getting Nyel well and getting him walking and can put our recent experiences behind us. 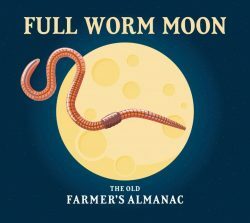 The March Moon is called this because the ground begins to soften and earthworm casts reappear, inviting the return of robins. 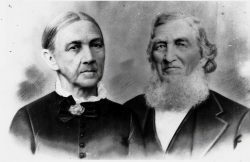 I am so enjoying the interviewing and researching process involved in my current Observer series, “Our Grands and Greats.” I am blown away by how much (but sometimes how little) those I interview know about their forebears. 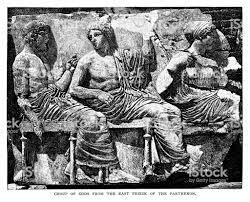 I’ve just completed the eleventh article in the series and I have a formed a tentative rule of thumb about our knowledge of our ancestors: the closer the family has stayed to their ‘roots,’ the more they know. In general, those who are fourth or fifth or sixth generation here on the Peninsula know far more about their forefathers than their recently arrived neighbors. It stands to reason, of course. If people didn’t move on to start a new life, they obviously remained better acquainted with and connected to the place of their origins. 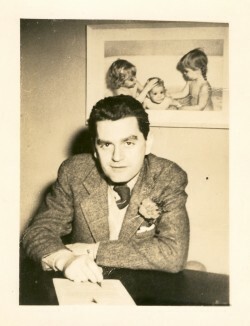 And, probably, their ‘things’ did too – the photographs, perhaps some treasured letters, their “good” furniture or Sunday dishes were less likely to become disbursed. And with the things, there are often stories. If we’re lucky those don’t get lost either. For me, it’s the stories that really connect us to our forebears. 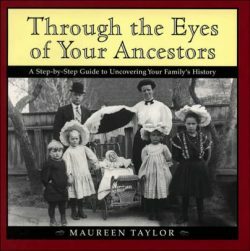 With all the possibilities these days on ancestor.com and similar sites, we may have the illusion that we are learning about great-grandpa or great-great grandma. But are we? What lies beyond the dates and place names and copies of marriage licenses? What sort of person was he or she? Who were their neighbors and how did they get along? What of their character traits? Did they have a good sense of humor? Were they outgoing? And what would they have considered their crowning achievement? I loved listening to my grandmother when I was a child. One story she told me was about her love of swimming in the “tank” (as they called the indoor swimming pool) when she was a girl. “As soon as I dove in, I’d kick off my swimming togs,” she told me. 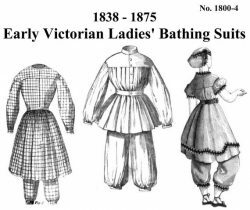 “I loved the freedom of being unclothed in the water.” I remember only that I wondered why she felt that way, little realizing what the swimming ‘togs’ of the 1880s looked like and must have felt like weighted down with water. Nor did I wonder about who else might be with her or any other privacy ramifications. I wish I’d asked, but I’m ever grateful that I had that even that little peek. And my mom’s story about being the only girl of the 14 kids about her age in Oysterville. “I was always a tag-along,” she told me. And when I asked, she said, “Yes, I was definitely a tomboy. I was the youngest of seven and I think my mother just let Willard and Edwin look after me. 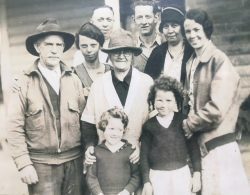 She let me wear coveralls at home, but I had to put on a dress when I went up to Grandpa’s house.” My totally feminine mom — with her hats and her jewelry and her love of clothes shopping! A tomboy! 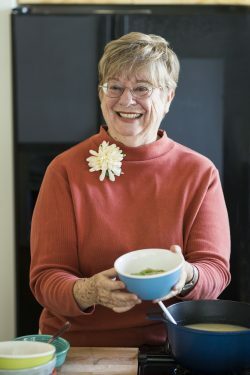 Putting that together with her first-ever purchase of blue jeans at 86 years old – she was going out with Les Wilson on his boat – gives a totally different look at who she was. That R.H. Espy had a “tot” of whiskey every day before breakfast makes him a little more human. 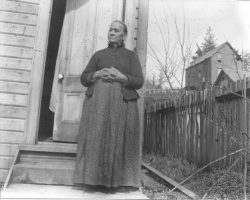 That my great aunt Dora – so stern and formidable seeming as an old woman – begged and begged her mother for hair ribbons when she was a girl or that my garrulous Aunt Mona confused “no” and “yes” when she was very young — until the day someone offered her a piece of candy and, at her response, didn’t give it to her. The stories don’t have to long. They just have to go a bit farther than a name and a date. Write them down! One here; one there. They’ll add up to more than you can imagine. And while you’re at it – write down your own stories – What was your most embarrassing moment as a teen? 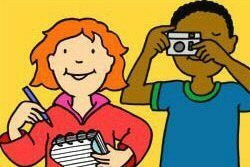 Who was your best friend before you started school and what kinds of things did you do? What was your biggest adventure as a young adult? Write it down! For posterity! So your descendants will know more than a name and date. Nyel says I have an active fantasy life. It is not said as a compliment – more as a scoff about something I’ve dreamed up to solve the world’s problems. Or, more likely, a problem of our own. This morning, for instance, I woke up thinking about our garden. The grass has grown to baling length and, because Nyel is wheelchair-bound for a few months, Chuck is coming over today to mow. Bless him! But, Chuck is still recovering from a broken foot (what is it with these old guys, anyway!) and says he won’t be bagging/dumping the grass. Totally understandable. 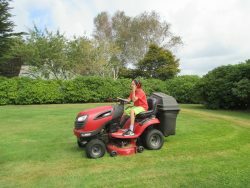 On the other hand, there will be a plethora of brown-turning mowing debris and, IMHO (in my humble opinion) that just about negates the entire mowing operation. I’m going to do what I can, but I know from past experience that it’s a job beyond my vintage-1936 capabilities. So… here comes the fantasy part. 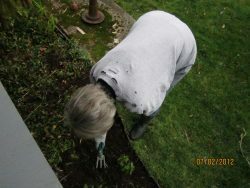 I was thinking about my oft-mentioned claim that any work I do in the garden is my “exercise program.” I know many people a decade or so younger than I who pay good money every month to go to the gym for their own physical regimes. 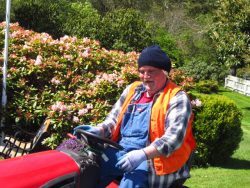 I could give them a very good monthly deal – less than the gym – to come here and work in the yard. Their choice of activities and at whatever time is convenient. We’ll supply the tools – rakes, wheelbarrows, hoes, digging forks… whatever. Stretching, bending, lifting, pushing – whatever exercise is needed can be accommodated. Build your own program! “You have a rich fantasy life, Sydney,” resonates at this point in my reverie. But, I know that’s not true. If it were, I’d be writing best-selling fiction (which, as we all know, make pots more money than do books concerning the history of southwest Washington state.) Then I’d be rich and I could hire someone to take care of those pesky grass clippings. Although… truth to tell, I like the idea of providing an exercise service for the elderly. And at a minimal charge, too. Say… twenty-five dollars a month? Contact me if you want to subscribe! I’ve been interviewing people these last few weeks for my Observer series “Our Greats and Grands.” I don’t think I’m very good at the job though Lord knows I’ve done scores, maybe hundreds, of interviews in my time. I thoroughly enjoy the whole process – getting to know my subject(s), finding out what’s important to them, hearing about their area(s) of expertise. And, I love the writing part – trying to capture a little of the emotional content behind the facts. 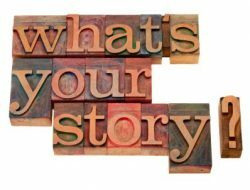 Telling someone’s story from their point of view. Recording the history for posterity. But… as I say, I’m not especially good at it. I think the fault lies in my limited listening skills. Or maybe, nowadays, my limited remembering skills. I find that I get involved in the conversation and that’s not always conducive to documenting the facts. My friend Cate uses a teeny tiny tape recorder in addition to taking notes – a good idea but way too time consuming to go back and, essentially, “reconduct” the interview in order to double-check facts. 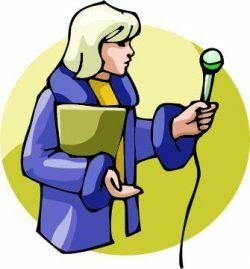 So, I begin every interview by forewarning my subjects that I’ll be getting in touch with them – not only for fact-checking, but also for the additional questions that are sure to pop up as I begin writing. This morning, though, the shoe was on the other foot. I was the one being interviewed. A reporter from Cannon Beach was doing the questioning. Fortunately, she had one of those lovely little tape recorders. Even more fortunately, she brought a friend with her who turned out to be my cousin. Small world!! I’m pretty sure I got my facts straight but I’m also sure I didn’t stay on track very well. It was way too much fun! Oh! And the article? You’ll have to wait until the next issue of Our Coast which comes out next Spring. Until then… I think I’ll look into a little tape recorder. It makes the interviewing process seem so easy! On our return to old stomping grounds (mine) in California last week, I found the physical changes to the landscape disorienting and somewhat distressing. I was pretty sure, though, that given enough time I could get used to the new freeways and buildings, the new housing developments and shopping malls and the huge influx of people that are responsible for all of the above. Growth and change, as difficult as they are to accept as we age are, after all, inevitable. But while we were gone, I learned of another change that I don’t find quite so easy about accepting. 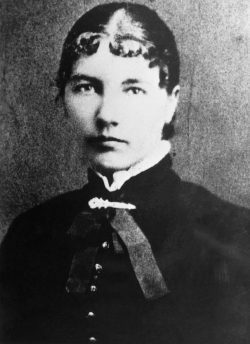 Two days ago, the New York Times Book Section ran an article that began: The American Library Association is dropping Laura Ingalls Wilder’s name from a prestigious children’s literature award in order to distance the honor from what it described as culturally insensitive portrayals in her books… The decision was made out of a desire to reconcile the award with the organization’s values of “inclusiveness, integrity and respect,” representatives of the association said in a statement on Monday. The award is given out by its children’s division. OMG!! The award recognizes authors and illustrators whose books have created a lasting contribution to children’s literature. It has been distributed to just 23 people over more than six decades. Wilder, herself, received the first award in 1954, three years before her death in 1957. It was initially distributed every five years, but its frequency has steadily increased. Since 2016, it has been given annually. 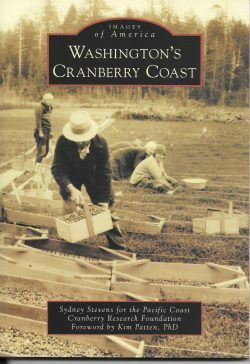 Eleven of the photographs submitted to Arcadia for “Washington’s Cranberry Coast” are not acceptable for one reason or another and need to be replaced. In the great scheme of things, eleven out of 198 isn’t too bad, I guess. We are scrambling to find suitable substitutes. Another deadline! Yikes! There are two that are going to be difficult. The emails between the Title Manager (my Go-To-Contact-and-The-Buck-Stops-Here person) have been flying back and forth. Today I’m sending the original 1913 brochure (from which one of the photos came) back to South Carolina for ‘Production Team’ to take a look at. Maybe, just maybe, they can find a way to use that one. 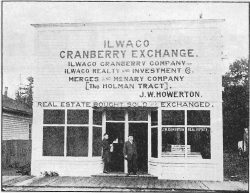 It’s the only known image of the Ilwaco Cranberry Exchange building. The other is apparently hopeless. Sadly, it effects the ending of the book and I’m wracking my brain on how to salvage the concept with another photograph. 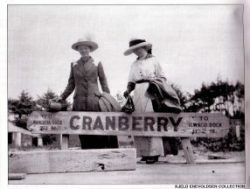 The rejected image is also from the early 1900s and is a picture of two women holding the sign for Cranberry Station – one of the railroad stops on the old IR&N. It’s the perfect photo to make my ending statement and, as far as I know, there is no other like it. The trouble, according to Arcadia, is “low resolution” and the image will apparently pixilate when reproduced to the size needed. Total bummer. Everyone needs a good friend like Maggie. I mean that sincerely. Maggie is my best ever cheerleader when it comes to writing. And she is my best tell-it-like-it-is critic. Besides all that, she knows of what she speaks. 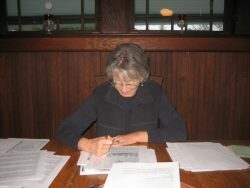 Maggie is an author and an editor. 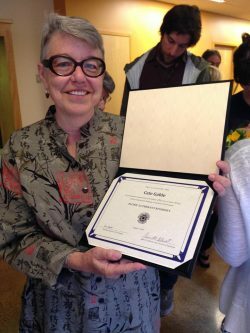 She’s been in the book business for thirty (or maybe forty) years. She’s worked in publishing houses in New York and she is ‘connected’ (as they say) with agents and editors and movers and shakers of all descriptions. So, when she asked to read my “Willard Book” as I’ve come to calling it, I was delighted, if a bit intimidated. The book is on hold. I thought it was finished five years ago – at least finished enough to send it to WSU Press as a possible companion book to Dear Medora. Not interested came the reply. I’d like to say it’s because they have a new editor now, but in my heart of hearts I know that the book is not ‘there yet.’ As is often the way, though, other things have taken precedence and I never seem to get back to Willard. Not seriously. When I do look at it, I get caught up in its… morass, for lack of another word. It’s full of family and secrets and stories that only I know. But my voice isn’t clear; Willard’s is clearer. It’s not the book I have in my head and it doesn’t do the book in my heart justice. I know that. So, even though it was with some fear and trepidation, I entrusted this rejected version to Maggie and, amazingly, she read every word. Yesterday she came over to talk about it. Like the good cheerleader that she is, she began by saying, “You are a good writer, Sydney.” The next sentence, though, is the one that counted. “You’re better than this.” And she tapped the pages of notes she had written. Chapter-by-chapter notes taken as she (probably) slogged through my manuscript. I loved her approach, of course, but the main part that I heard was – re-think and re-write. And I knew she was right on the mark. She said the words that I have been refusing to formulate for five years or more. It didn’t even occur to me to respond, “Easy for you to say.” Because if anyone knows how hard it is to come at a book from a different angle, it’s Maggie. She’s paid her dues many times over and she knows of what she speaks. But… she didn’t leave it at that. She had some ideas for me. Different approaches I might take. None that resonated right then… but I woke up this morning with something stirring. Some thoughts taking shape. Some work waiting to be done. Thanks a lot, Maggie! And I do mean it sincerely! I hope you’ll keep cheering for me and saying it like it is. There aren’t many friends who can or will. You are the Maggiest! So… when I realized mid-stroke (on my keyboard) about ten o’clock last night that I hadn’t written my daily blog, I was a bit surprised but… oh well. I extricated myself from my cranberry world and went to bed. I am considering today’s musings as a two-for-one deal. And, depending on how things go, it might be ‘all she wrote’ (again, maybe literally) for three or four more days. 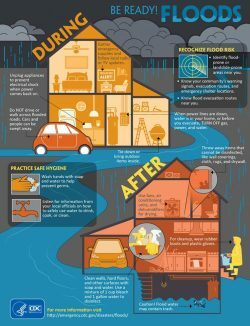 Tuesday is Delivery Day – “God willin’ an’ the creek don’t rise,” as my friend George Talbott used to say. On Wednesday, though, I had a BC (Beyond Cranberries) morning. It was our final Community Historian gathering and, as is often the way of it when your plate is already full, I was in charge. Fortunately, I had done the arranging well ahead of the cranberry crunch, I didn’t have to do much but to show up and moderate a panel of THE most interesting people ever. Phil Allen, Charlotte Killien, Jane Snyder, and David Williams had all agreed, way last February, to come and talk about their ancestors. “Our Greats and Our Grands” is what we called the presentation. 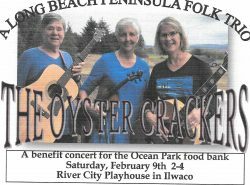 The common thread, of course, is that all of these interesting folks are fifth or sixth generation Peninsula residents – either full or part-time. Their forebears go back to the beginning of settlement on the Peninsula and, in the case of Charlotte and Phil, back beyond that by a good long way. Among the four of them, (actually, the five of us if I count myself) there were relationships and connections from generations ago. And, even more interesting, there were family connections with several of our audience members!